It has has been a dream of mine for a long time to go on a multi day bike journey, I am very lucky to get to do all the fabulous things I do but I have envied my friends and Geoff when they go off on their biking adventures. 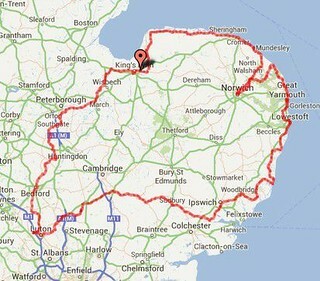 BUT Tomorrow I start my own bike adventure with a very special bike journey, The Lap of Anglia. A 4-day journey that will take me and 40 other riders from Kings Lynn to Norwich, Norwich to Ipswich, Ipswich to Luton then Luton back to Kings Lynn, a total of 400 miles. You may wonder why I would want to do such high mileage over 4 days but its all in aid of the East Anglican Air Ambulance, such a fantastic service that relies on donations to continue to survive. This ride is not a race or a sportive, it’s not about getting from A to B as fast as possible, it’s about making people aware of the great work the Air Ambulance does and how it’s funded by donations, something I did not realise. Hopefully the three 200km Audax rides that I have done, and dragged Geoff along too, have taught me how to pace myself better on long rides, how to fuel myself better and how important it is to take a little stop every 20/25 miles or so, by doing this I have never finished a 200km Audax feeling tired or worn out. This will be a tough challenge for us all, but most of all it will be fun, meeting new people, making new friends, having a laugh although I expect there will be a few sore bits too !!! You never know when you, a family member or a friend may need the help of the Air Ambulance……….and if you see us on our Journey be sure to give us a wave of encouragement. This entry was posted in Biking, Events, Lap of Anglia on August 15, 2017 by Sally. Will be watching out for your comments on the way , good luck .will the Tele cover it?? ?